The Champion System MAC invaded southern New Jersey this weekend, and it brought out the Storm Troopers. 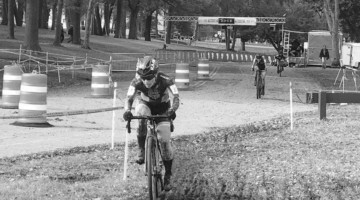 After bouncing around the schedule for the first half of its long life, the Beacon Cyclocross has, in recent years, developed a tradition of pairing with HPCX in central New Jersey for a UCI-sanctioned double-header on Halloween weekend. Team C3-Athletes Serving Athletes, who have exercised imperial dominance on the MAC team standings for the past three years, have a long-standing Halloween tradition of their own, as they don special-edition skinsuits for each year’s Halloween races. This year, in honor of their team slogan, “the dark side” (a tongue-in-cheek reference to their black uniforms), Laura van Gilder and her teammates toed the starting line clad in skinsuits patterned after the Storm Troopers from the Star Wars movies. It proved prophetic as the team swept the women’s podium. With current UCI World #1 and two-time defending Champion System MAC season champion Laura van Gilder on the start line, few would have bet against her firepower. But while C3-Athletes Serving Athletes’ Storm Trooper skinsuits had announcers throwing around science fiction metaphors, Team Cystic Fibrosis’ Kristin Gavin had a more down-to-earth metaphor of her own. “It was a yard sale out there,” said Gavin, who crashed twice during the race on the deceptively technical Beacon course. “It’s so fast here that you have to stay alert. 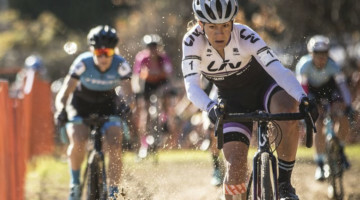 If you make a mistake and take a wrong line, your bike might leave you.” Just after the remount following the first trip up the two-story “Amphitheater of Pain” run-up on the first lap, van Gilder made just such a mistake and hit an exposed root with her pedal. The resultant crash took down much of the still compacted field and allowed Van Gilder’s teammates, Dee Dee Winfield and Arley Kemmerer to escape. Within minutes, Winfield was in full power mode and time trialing a huge gear all the way around the Beacon Course, which remains nearly unchanged since its inception nearly a decade ago. Kemmer rode with Winfield briefly, then dropped off as Gavin and her Team Cystic Fibrosis teammate Nikki Thiemann worked together in vain try to reach her. Van Gilder, near the back of the field and 45 seconds down on Winfield, started her own time trial to chase down the leaders. At each time check around the lap, van Gilder would gain between two and four seconds. One by one, van Gilder worked her way through the field like a domestique through a stage race caravan, until only Winfield and Kemmerer remained. Even though Kemmerer was a teammate, she wasn’t going down without a fight. 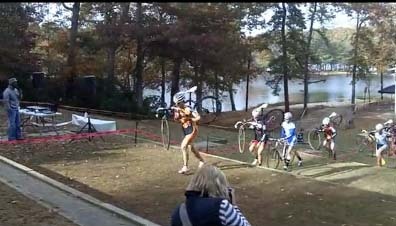 But she was no match for the powerful van Gilder, who was bleeding from a big gash on her shin suffered in the first lap race. 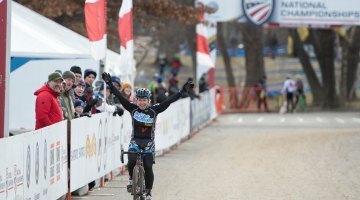 But van Gilder’s chase ended there as she was never able to pull back any significant time from the flying Dee Dee Winfield, who scored her first UCI win of the season. 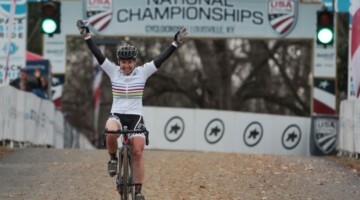 Still, van Gilder could be satisfied in a team sweep of a UCI race podium. But no attacks were forthcoming. The final 750 meters of the Beacon lap consist of a sweeping left turn up a steep, punchy hill. This is followed by a turn and drop-in to the Amphitheater of Pain and its 24” to 28” high steps that are approached via a hairpin turn. Following the remount is the short wooded section where Laura Van Gilder crashed in the women’s race, a short drop and the tight finish corner leading to a 200 meter paved straight. Sprinter Myerson approached the section in seemingly perfect position as second wheel behind Scherz — then lightning struck (perhaps it was “Force” Lightning?). In a classy move going up the run-up, Myerson told the group he had punctured and then moved out of the way so he wouldn’t interfere with the sprint. 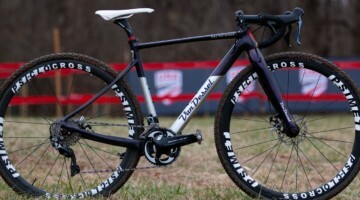 Heading into the final turn, Scherz led McGrath, who has become a regular at the New Jersey races because he races for New Jersey-based Van Dessel bicycles. The two had barely a bike-length gap on the rest, but it was enough to turn the fight for victory into a one-on-one duel. McGrath explained what happened next. “I can’t sprint,” he said, despite coming from behind to lose by inches in a battle of bike throws. Knapp claimed third ahead of Schempf and Richey, while Myerson stayed ahead of all the chasers to finish sixth. The Champion System MAC Series continues Sunday with the HPCX and next week at Fair Hill, Maryland with the First State Velo Sport Xross. For more information, see BikeReg.com.